Now you are talking and cheap too. I've been watching it on the16v Mini club site.This is just what Hans needs, Japanese reliability! I did speed read it so forgive me if I'm wrong But han't he already gone through two Toyota engines already? I think hes gone through a couple of engines as he's basically not a lot of time to do thorough checking over. you do realize the 4age is basically a domesticated BDA! Wolf in sheeps clothes. Not a bad engine at all. Come on Alan, hows about it? - water hose ruptured because it was old and gone spongy due to earlier oil leaks (previous owner), now replaced with a new one. I knew it was bad before the trip but hadn't the time anymore to find a new one. The only reasons for having a Toyota (Yaris) engine would be: more refined running, 5-speed gearbox, less wear and maintenance, more usable power. 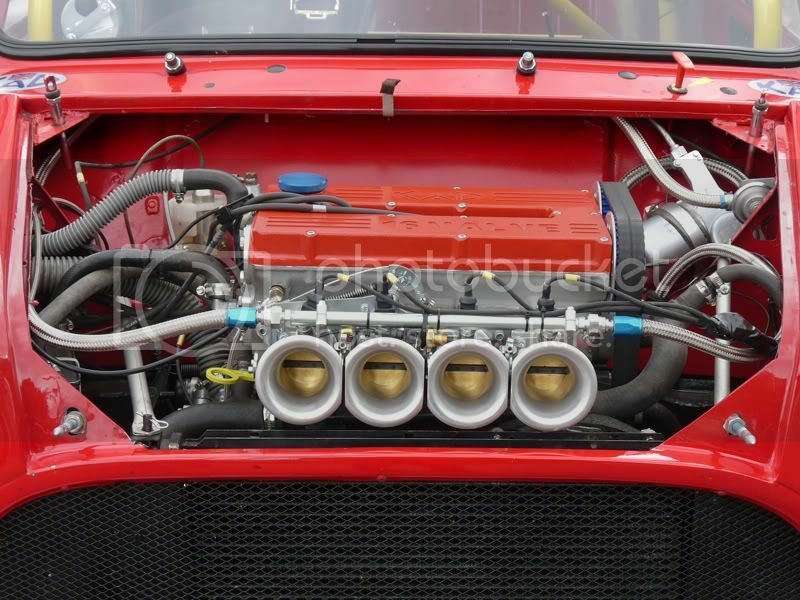 It is worth mentioning that Ed's coupe with a standard 1300 engine with twin carbs and airbox pulled easily away from me. My turbo needed a few seconds to spin up and then my car catapulted towards him and I had to release the throttle again. Completely useless (but fun). Less fun was the huge fuel consumption. Ed did on the return trip 1:19 km/l (have no idea how that converts to imp sizes). My car did between 1:10 and 1:12, almost double his fuel consumption! I think that 2CV with Ferrari engine uses less fuel than my car. (and no, as far as I know my tank doesn't leak). Supercharger might be better Hans, if your after bottom end grunt. No I am happy with the turbo, I like its wild boys behaviour with all the wheezing, sissing and whining. But it just shows how good an almost standard A-series engine is. It's easy to maintain, overhaul and repair. It's fuel efficient if you want to and does a good job dragging the Midas along. It's drawback in my opinion is its weight (about 50kg above a comparable modern engine), size and the lack of a refined gearbox. For the moment I am not doing anything to the engine, it works and there is plenty of stuff to do on the car itself. I now have a whiteboard in my garage with a large ToDo list. But first a bit of work in the neglected garden and trying to push out the new TGT in a week or two.